The exotic lanzone provides nutrients that make it a healthy treat. It is the fruit of a tree that grows throughout Southeast Asia and southern India. The fruit grows in clusters, is oval-shaped and has a gray-yellow to pale brown skin. Inside, the fruit is a translucent white and very juicy with a slightly sour, and sometimes bitter, taste. While it can be served cooked, the lanzone is commonly eaten raw, although you can buy the fruit in specialty grocery stores as either candied or canned in syrup. Only the meat of the lanzone is edible -- the seed is not. 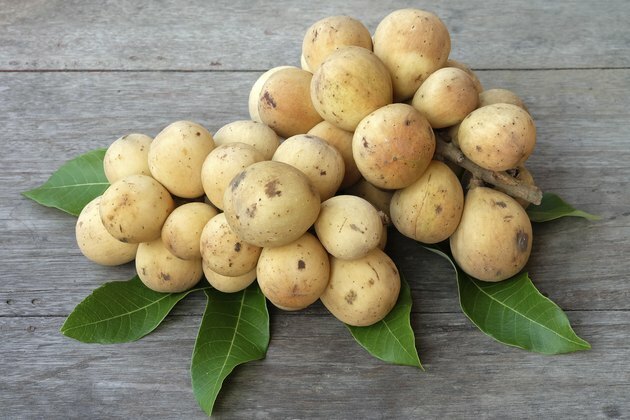 A 100 gram serving of lanzones, roughly 3 1/2-ounces, contains just over 2 grams of fiber per serving, proving 8 to 11 percent of the recommended dietary allowance of fiber for adult women and 6 to 8 percent of the RDA for fiber for men. A diet high in fiber reduces the risk of heart disease and it can also help with relieving the symptoms of — and possibly prevent — constipation. Lanzones are also a source of B vitamins and an especially good source of riboflavin, also known as vitamin B2. A 3 1/2-ounce serving of lanzones has 124 micrograms of riboflavin, or 8 to 11 percent of the RDA for riboflavin for adult men and women, which ranges from 1,100 to 1,600 micrograms for women and 1,300 micrograms for men. B vitamins help with the processing of carbohydrates into usable energy and help keep your nervous system functioning properly. Lanzones are a good source of natural antioxidants. In addition to containing some vitamin A, they also contain polyphenols, another natural antioxidant. A study published in 2006 in "Food Chemistry" found that lanzones had antioxidant capabilities similar to other tropical fruits such as bananas and papayas. Antioxidants in foods help your body break down damaging free radicals, which can increase the rate of aging and may cause disease. Choose fresh lanzones over the candied or canned ones to reduce the amount of added sugar you consume. A diet high in added sugars can increase your chances of obesity. You peel lanzones before you eat them. Some lanzones, also known as wild lanzones or wild langsat, excrete a milky latex when peeled. If this is the case, dip them into boiling water to reduce the gumminess of the fruit before eating. If the flesh of your lanzones adheres to the seed, it may have a bitter taste.